You can create, print, email, approve, sync (accounting integration enabled), export to external packages, and reverse client billing invoices from the new Client billing invoices console. This can be accessed from Console > Client billing invoices. For more information on client billing such as how to configure billing items or generate charges click here. 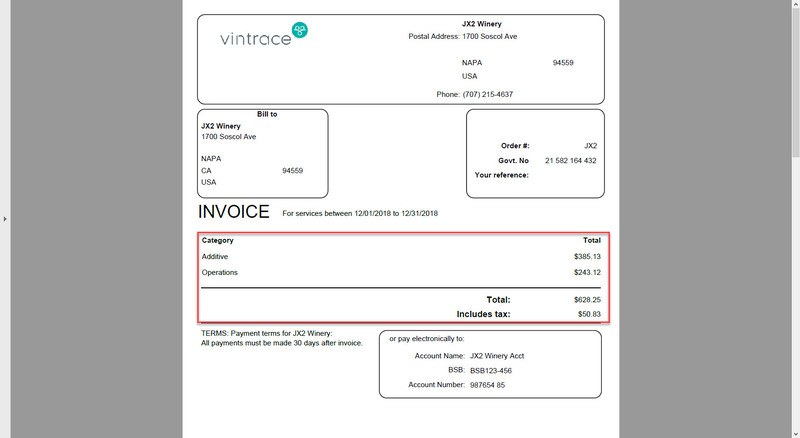 By default, charges raised in vintrace aren’t added automatically to invoices. This gives you an opportunity to review the charges, make changes, and add more charges before finally raising the invoices. Invoices are raised in Client billing invoices > New invoice run. To raise invoices, search for the charges to include. If you want to break the invoices up and have different charges on different invoices you need to adjust your search criteria. In the example below, we have selected JX2 in the Service orders filter and set Date range as This month. Click on Generate invoice to create invoices for the search criteria you have selected. The newly created invoices are auto selected in the Client billing invoices console. 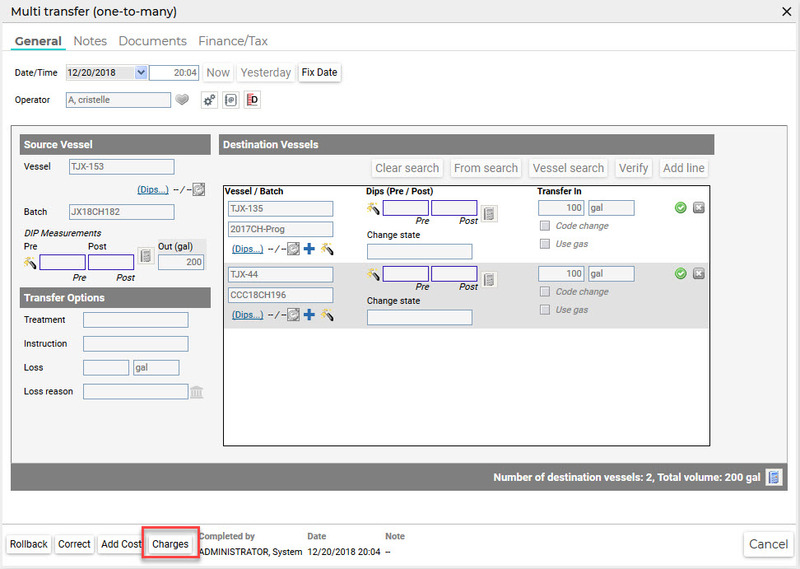 Click the Invoice number or Actions icon, and then View details to view the charges on the generated invoice. In the View details screen, you have the option to print, approve, sync, email, or reverse the invoice. Once charges are invoiced, you can no longer update them. You can print a single invoice from the Action icon on the invoice line item in the Client billing invoices console or you can print multiple invoices by selecting multiple invoices and clicking Actions > Print invoices at the bottom of the table. vintrace provides a standard PDF version of an invoice that can be further tailored to your needs including your own detailed remittance advice. Please contact us for assistance in configuring. 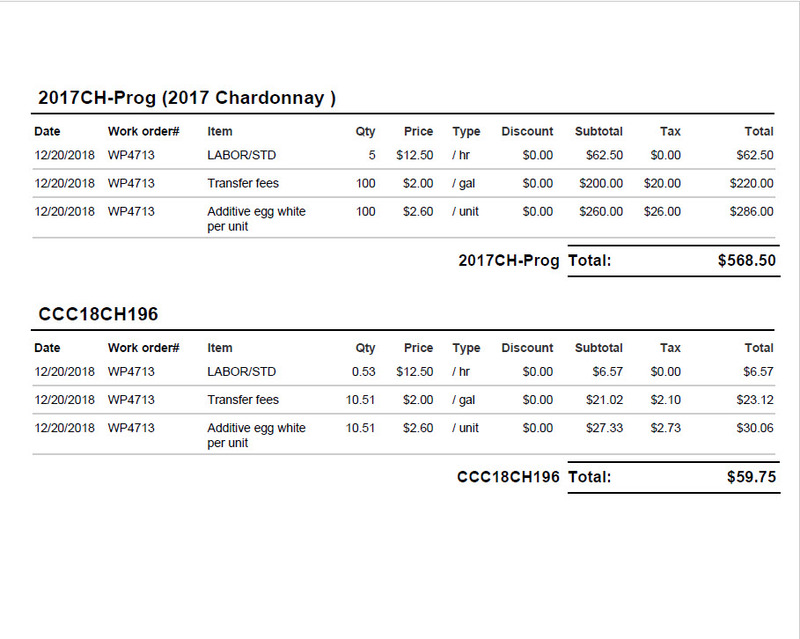 Below is a sample of the default printed invoice format. The first page displays the charges according to billing item category. The next page shows you the breakdown of the charges per batch/stock item. If you are planning on exporting your invoice run to an external package, choose the desired invoice format from the download icon. For information on Accounting Package Integration, click here. This will direct you to separate articles for exporting invoices to your particular accounting package. You have the option to email single or multiple invoices to the respective parties on your service orders. Make sure you have an email address set in the address book for the party set on the service order. If you want to edit the charges on an invoice, you have to reverse the invoice first. After you have reversed an invoice, all the charges on that invoice become editable in the Service charge screen. 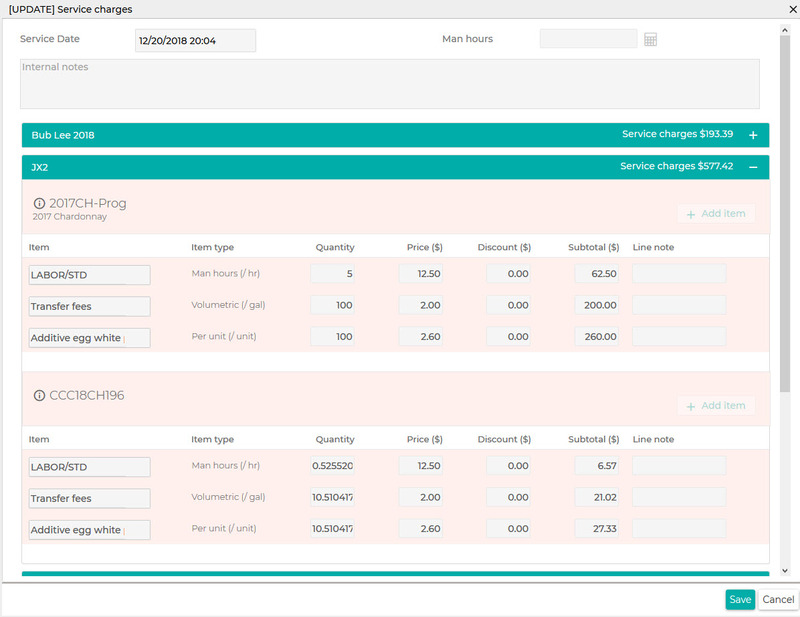 You can view the service charge screen by viewing the operation that the charges are linked to and click on Charges. You can then update the charges and save them, then generate the invoice again for the same service order and period. If you have accounting integration enabled, and the invoice has been synced to Xero, vintrace tries to delete the invoice from Xero if it is still in draft mode when you reverse it from vintrace. If the invoice has been approved in Xero, you have to manually delete it after reversing the invoice.